It’s going to be a cold ride home….. Still hauling our produce by snowmobile to the market. Hello, April! Even fat tire bicyclists are enjoying the ice bridge this winter. A wonderful sight to see on a Friday afternoon, and we hear there are more coming across to visit. 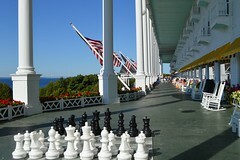 If you are among the adventurous coming to Mackinac this weekend, stop in and say Hi. Beautiful day for picking up the food order on the mainland. Another successful Great Turtle Drop. Happy New Year to all and to all a goodnight. Happy New Year – Rich is preparing the turtle for the Great Turtle Drop. Baby it’s coldddd outside! A snowy downtown Mackinac Island with a 1,000-footer heading toward the Mackinac Bridge and Lake Michigan. Merry Christmas from the Cottage Inn on beautiful Mackinac Island. 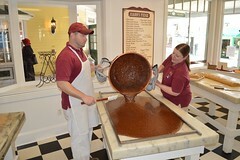 The Christmas fudge order countdown begins. Deadline to order holiday gift boxes packed with fresh Murdick’s of Mackinac sweets or to place custom orders is 5 P.M. TUESDAY. Snowfall accumulation is beautiful today. Islanders are out enjoying the beauty of winter on Mackinac. Another amazing photo from Nancy May! See this first hand, Lilac Tree Lilac Tree Suites and Spa has rooms available Dec 27 & 28! A quiet Fort Mackinac under a blanket of snow. First heavy snowfall on the Island, and one word to describe it: Beautiful! The Winter shed is put away, and Spring is here!! The ferry passing Mission Point as they go the long way around the island! A welcome sight! The crew punched holes in the ice and the “Mighty Huron” is running at the dock… Anticipating breaking through the ice so we can start running sometime next week! 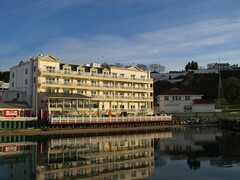 A view of Grand Hotel. 3/20/13. Looking lovely in the sunshine. Good morning from Mackinac! A beautiful shot courtesy of Mackinac Island News and Views. The chilly Straits March 8th 2013. Now this is what we call a Beer Run! Happy Friday! We hope everyone had a wonderful Valentine’s Day and that you have something fun planned for the weekend. If you make it to Mackinac this weekend be sure to stop by Cawthorne’s Village Inn for one of their great dinner specials! The view for a couple of native islanders who walked from Mackinac Island to St. Ignace this morning. It took them about 3 hours. Heading to the Island, temp at zero & going down tonight! Some still get around on bikes even with the snow. There is snow on the road again! It’s looking beautiful outside tonight! Snow is falling on the island! Yay!